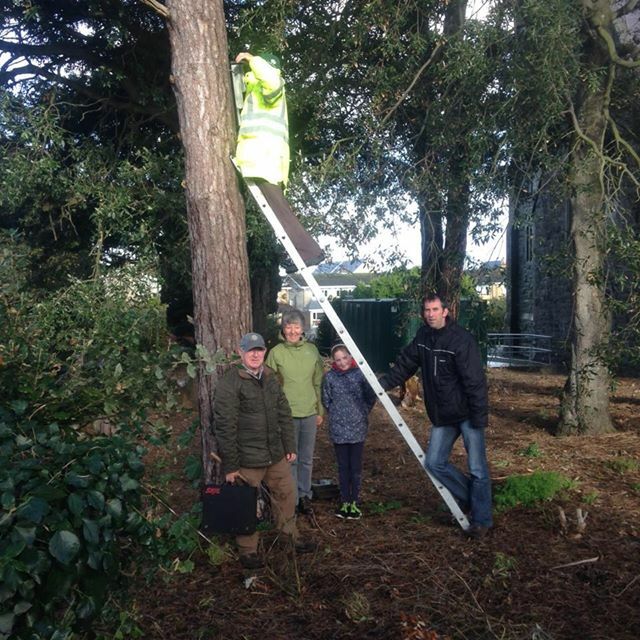 On Saturday 15th November, BirdWatch Ireland members invited representatives of the Fóroige group and the Tidy Towns Committee (one of the committees of Skerries Community Association) to come along and help erect the boxes. The sites selected were in the grounds of the Church of Ireland and in the park adjacent to the Mill. The sites chosen for the bat boxes are close to known existing roosts. The bird boxes were placed in areas of high bird activity. The bird boxes will be monitored for activity in spring by Birdwatch Ireland who has undertaken to clean them each year after use, to make them ready for the following year’s occupants. Paul Denny on ladder, Jim English, Breege Madden, Abbey Holland and Paul Lynch. This entry was posted in SCA, Tidy Towns by SMcK. Bookmark the permalink.